This was a tough week. Friday was supposed to be my last day of week but I had to move that up to Tuesday due to a family emergency. I spent Wednesday and Thursday at my sister's watching my 2 nieces, which was fun, but quite tiring...and I'm heading back there for a few days again next week. 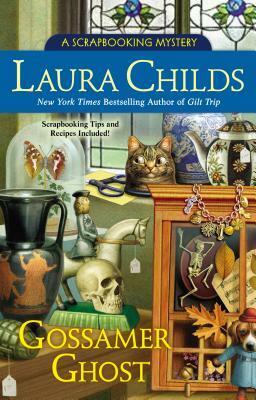 My thoughts: This is the 12th book in Laura Child's A Scrapbooking Mystery series and I just love this series. I love the setting and I love the characters and I loved that this one was set during Halloween - it just seemed to add an extra sense of spookiness to the story! Finding a dead body in the store next to her scrapbooking store is the last thing Carmela expects to happen in the week leading up to Halloween and yet of course, she can't just walk away. I love, though, how her best friend Ava is just as willing to help out with the sleuthing this time as Carmela is. These two balance each other out quite nicely - Ava is quite spontaneous where Carmela is more methodical when it comes to her sleuthing - they definitely earn the nickname "Lucy and Ethel!" It turns out that there is more than just a murder to be solved. There is also a rare mask missing from the antique store and that might have been the motive for the death. This adds a new layer to the mystery and provides some interesting history as well. I love that these books are quick, fun reads. This time around I was quite shocked at the guilty party, never once having guessed they had done it, but that's half the fun in reading these types of books. I also love all the fun scrapbooking tips and recipes that are included both throughout the book and at the end. In today’s “lean in” era, debut novelist Siobhan Adcock casts the issue of whether women can ever “have it all” into a superbly written novel that will have readers everywhere talking. Bridget has given up her career to raise her daughter, but now a terrifying presence has entered their Texas home—and only Bridget can feel it. In 1902, motherhood spurs Rebecca to turn her back on her husband, despite her own misgivings. 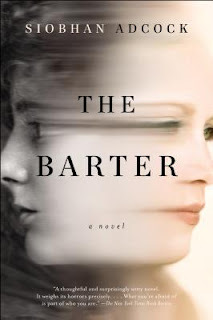 As Adcock crosscuts these two women’s stories with mounting tension, each arrives at a terrible ordeal of her own making. 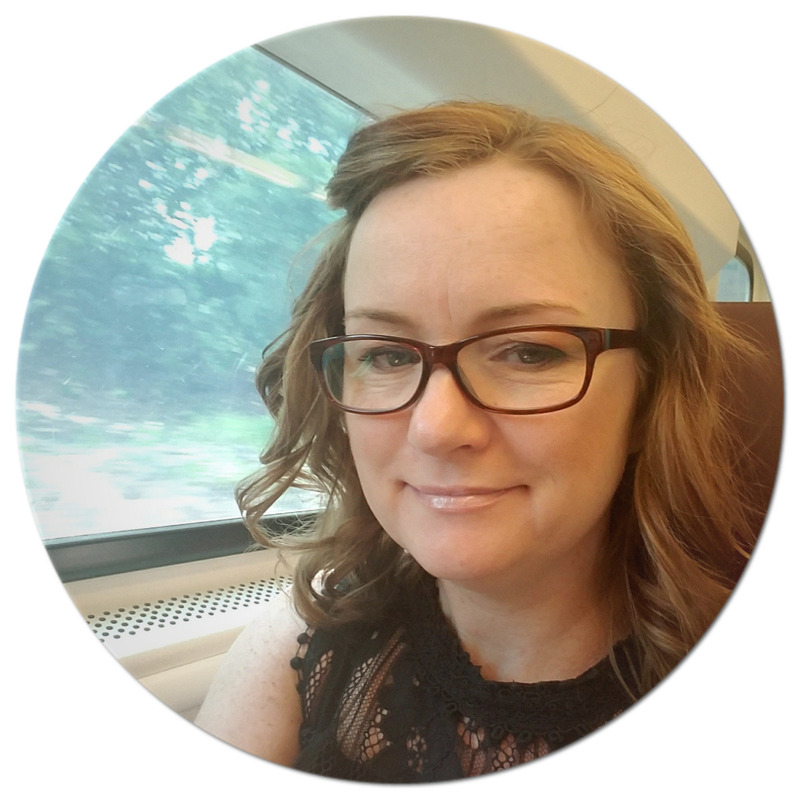 About the author: Siobhan Adcock received her MFA in fiction from Cornell University, and her short fiction has appeared in several literary magazines. She has worked as a writer and editor for Epicurious, Gourmet.com, iVillage.com, and The Knowm among other digital publishers. She lives with her family in Brooklyn, New York. *** Thanks to BookSparks for the heads up about this Spooky Read!!! At the center of this Shakespearian tragedy is Charlotte Fairfax, formerly the costume mistress of the Royal Shakespeare Company. Upstate New York is a long way from the royal stage, but Charlotte is always the queen of her domain. As this small production’s costume designer, she has stitched her way into everyone’s lives, learning more than anyone could possibly imagine about the rise and fall of Lauren Richmond. But curiosity killed the cat. And it might well kill the costume designer. Witty and wise work, Untimely Death, the first in Elizabeth J. Duncan’s charming cozy series, is sure to delight. 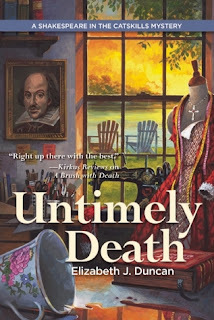 Thanks to the publisher, one reader can win a copy of Untimely Death by Elizabeth J. Duncan. To enter the giveaway, please fill out the form by November 6th. This giveaway is open to US/Canada residents only and ends November 6th. After the death of her husband, Bella Jordan and her son need a fresh start. But on their way to stay with family in Chicago, they stop in Lily Dale, New York and a storm forces them to spend the night. Brimming with psychics and mediums, Lily Dale is just the kind of quirky little town Bella's late husband always talked about settling down in. So when the local hotel's owner, Leona, passes away, Bella agrees to step in and help temporarily. The longer she and Max stay there, the more Lily Dale starts to feel like home. But for Bella, finding a home means finding danger, too. 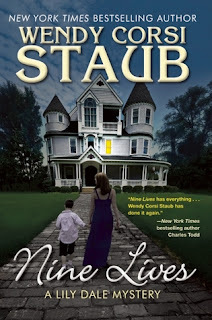 Leona was murdered, and it's up to Bella to track down the killer before her sanctuary comes crashing down in bestseller Wendy Corsi Staub’s warm and witty series debut. 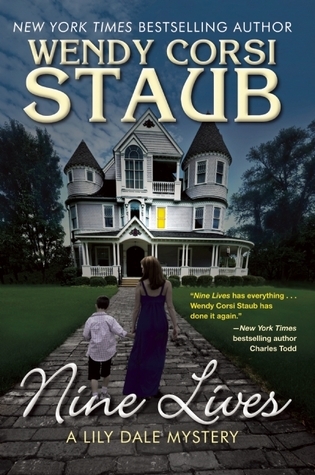 My thoughts: I was fortunate to pick this gem up at BEA this past Spring and to meet Wendy Corsi Staub during a book signing. I haven't hadn't heard of her before BEA, but ended up with two of her books and after reading this one, will certainly be checking out her other books. I really enjoyed this book and while it does have that little bit of paranormal, it was still a fun cozy mystery and I think I'm going to stick with this new series, at least enough to give the next book a try. Lily Dale is certainly an interesting town - what town wouldn't that's filled with psychics and mediums? But what I loved is that when things happen, the answer as to why they happen is just vague enough that there could be a logical explanation for it or it could be more of a paranormal/supernatural explanation for it happening - and that totally won me over. Things always happen for a reason and while Bella might not always believe that, something has brought her and her son to Lily Dale. She keeps saying that she's only staying for a day or two, but something keeps preventing her from leaving. Does she really want to live with her mother-in-law? It seems like Lily Dale might be a good place to put down roots, even though there's a murder to be solved. This was a great introduction into what I think will be a fun cozy series. It's faced-paced and kept me guessing all the way until the end. I loved all the characters that we got to meet in this first book and even the town itself is like a character - it has so much charm and personality. I can't wait to see what happens next for Bella and Max and the residents of Lily Dale. Next week, Along the Infinite Sea, the latest book by Beatriz Williams comes out (November 3rd!) and I'm super excited about this one. This is the third and final book of the Schuyler sisters and I've been looking forward to reading it since finishing the last one, Tiny Little Thing over the summer. I had the please of meeting Beatriz quite a few times and will be seeing her again next week. She's delightful and I have really enjoyed the books I've read of hers. In anticipation of release day, I have a giveaway for you - see below for details (2 copies are up for grabs!!!). 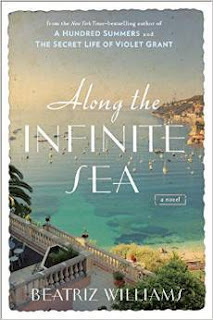 Thanks to the publisher, two readers can win a copy of Along the Infinite Sea by Beatriz Williams. To enter the giveaway, please fill out the form by November 2nd. This giveaway is open to US residents only and ends November 2nd. My thoughts: This is this year's Christmas Fool's Gold story and it was a fun, charming story that really gets you in the holiday mood. I really love this series and loved this love story. 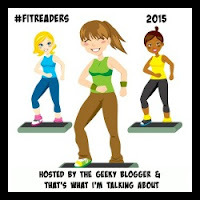 This is Madeline and Jonny's story - characters that if you've been reading this series in order, you've met before. But, if you are new to this series, not to worry, you'll be able to enjoy the story just the same! I love how Madeline and Jonny come together - she is asked by Mayor Marsha to help plan his sister's wedding because town's event planner is over-booked. Was Mayor Marsha up to her old tricks? Did she know about Madeline's secret crush she had on Jonny Blaze? I loved how Madeline and Jonny moved from just working together to having a relationship. 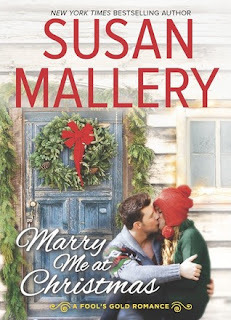 It wasn't a fast move, but rather a slow progression and Susan Mallery highlighted the difference between fan worship and regular man-woman love interest. Of course, Madeline falls prey to both, but in the end, she truly does love Jonny for the man he is and she proves that. A Fool's Gold book wouldn't be complete with Edie and Gladys and once again they provide some good comic relief. But, they are also full of surprises - they sure do have the backs of those they care about and often show up just when you need them. I'm not sure how long this series is going to be around, but I'm hoping that at some point we are going to get a little more on Mayor Marsha than just her setting things up in the beginning of the book. She is like the ultimate fairy godmother/puppet master and I just know there's more to her than meets the eye! Audio Thoughts: Tanya Eby really does a great job narrating this series...I just love listening to her and all voices she gives each character. She makes each book such an entertaining listening experience and I definitely plan to continue listening to the rest of this series as long as she continues narrating the books. 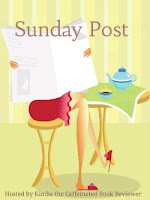 The Sunday Post is a weekly meme hosted @ Caffeinated Book Reviewer. It’s a chance to share news. 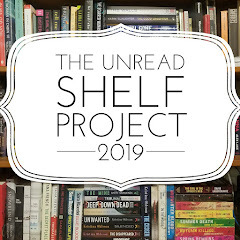 A post to recap the past week, showcase books and things we have received and share news about what is coming up on our blog for the week ahead. I'm also going to link this up with Kathryn's It's Monday post over at Book Date. Fall is definitely here! We had our first frost this morning and it has stayed in the 50s all day. I'm not complaining one bit as I love this weather - I love needing to wear a sweater and a vest or jacket with a scarf when out walking the dogs. And the dogs love the chilly air - it seems to give them a little extra energy or something - they just want to run around and play :) Of course, I just want to sit under a blanket with a nice cuppa tea and read, so we have to compromise...a few extra walks and some good snuggle time!!! Luckily they are super warm and love sitting under the blanket with me. I ended up going away last weekend and I didn't get a chance to post, so here is 2 week's worth of steps. I haven't made it to the gym in a while, but last week, I forced myself to hit my goal of 10k steps each day and I felt good doing that. It's going to be two more weeks of long days, but then things will be better - there is a light at the end of this tunnel and I can't wait to get to it!! !